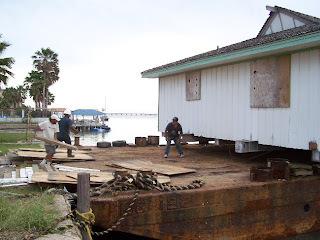 On Tuesday April 18, 2007 the historic "whale-back" house on Tarpon Street was moved in order to make room to a 48-unit condo. Since the house couldn't be trucked across Queen Isabella Causeway, Marine Services was hired with their tugboat and barge, shown below. The above picture is an early shot of re-aligning the house, boat, wheels, and creation of new ramps. The big tractor was used to pull the barge back in line, which was a feat because of the fast out-going tide. 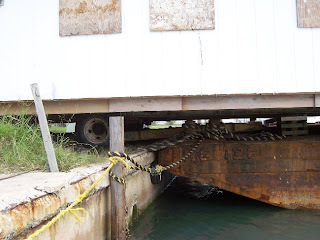 Meanwhle the tugboat was pushing at almost full throttle and fearless men scrambled underheath the house with heavy pipes, dunnage, winches, and tackle. At last all was prepared and Ray of A-1 moving tried once to pull the house with his souped-up truck, which nearly came on board but the house setlled backwards. Smoke was everywhere - exhaust, burning clutches, burning tires, hydraulic oil, and not to mention most of the workers smoked like stoves. I tried to help out from the peanut callery, as it was getting close to 7:00 p.m. "How about that stinky old tractor to just push a little?" Finally, with what has to be the oldest and strinkiest backhoe I ever witnessed, the house rolled up and over the dunnage with a great scream of the truck and a sigh from the house ... and honking of horns and applause. You never saw such a happier crew, which had been working since nearly dawn. 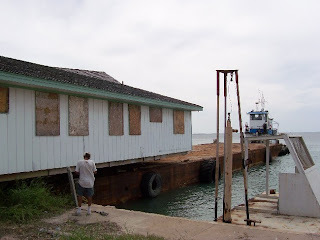 The house-on-a-barge stayed overnight, to be moved the next day on the high tide. If you have any subsequent pictures of the barge moving down to Port Isabel please let me know and I'll be more than to post some up here. Born in Oak Ridge, Tennessee next to a big honking nuke.